NASHVILLE – August 9, 2017 – CMT today announced fan-favorite and award-winning series, “Steve Austin’s Broken Skull Challenge,” the toughest competition series on television, returns for a punishing new season on Tuesday, September 26 at 10pm ET/PT. “Broken Skull Challenge” reached an average of two million weekly viewers during season four. The return comes on the heels of strong growth for CMT, which just notched its highest-rated fiscal 3rd quarter since 2014 with 14% year-over-year growth among Adults 18-49.Furthermore, CMT has posted 35 consecutive weeks of year-over-year growth with Adults 18-49.Competitively for fiscal 3rd quarter, CMT ranks as the fastest growing Top 50 (non-news) channel with Women 18-49. “Every season we’ve raised the bar and set new standards here at the ‘Broken Skull Challenge.’ And every season we’ve watched the finest athletes in America meet those challenges,” said Steve Austin. “But I guarantee you haven’t seen anything like the intensity of season five of ‘Broken Skull Challenge.’ And that’s the bottom line”. 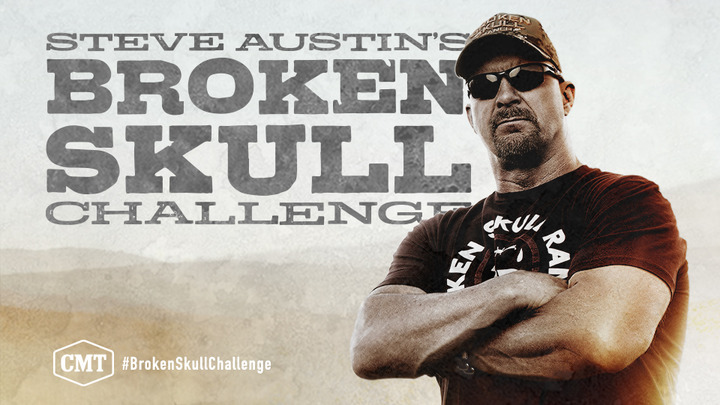 This season, a new set of America’s toughest individuals tackle the one and only Steve Austin’s Broken Skull Ranch. Each week, “Steve Austin’s Broken Skull Challenge” will feature world-renowned athletes and everyday heroes facing off against each other - and the desert heat –in a series of intense challenges with only one advancing to the dreaded “Skullbuster,” personally designed by Austin. The series is produced by 51 Minds Entertainment with executive producers Christian Sarabia, Steve Austin, Vincent Cariati, Steve Kaufman and co-executive producer Nicole Elliott. Jayson Dinsmore, Lewis Bogach and John Miller-Monzon executive produce for CMT.